We are a creative design studio based on integrity, a love of design and a commitment to quality. We work as a team combining our traditional art and design skills with our technical knowledge of print and production to produce effective, beautiful and memorable work. 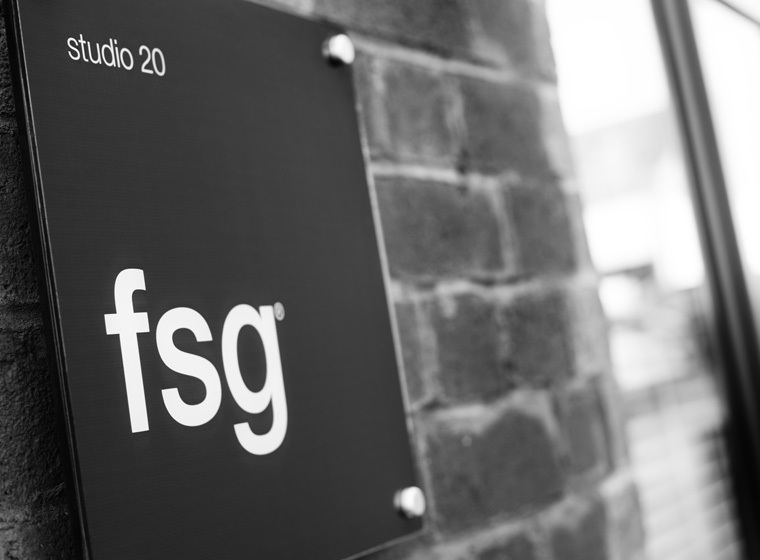 FSG Design was established in 1995 by designers Christopher Large and Marc Cram and Finance Director Liz Oldfield. After experiencing life in some of the largest multi-disciplinary design agencies in London and the Netherlands we wanted to use our passion for design to set up our own agency that was small and friendly, highly creative and focused on client relationships. Our intention has always been to remain small and to work across a number of sectors in order to maintain the freshness and vigour of our work. With the exception of taking on expertise in artworking, digital design and marketing, we have resisted the pressure to expand and have concentrated on developing great creative solutions for a loyal client base, working in sectors we enjoy and know we can add value to. Our aim is to provide a consistent, effective service through intelligent design and creative flair. We are an independent creative design agency, based in the heart of the East Midlands, who take great pride in the work we do for our clients in industry, education and not-for-profit sectors. We bring together a wealth of experience and acquired skills to form a small, hard working and approachable team. We produce work that is interesting, beautiful, memorable and effective and we love it when we meet clients who share the same beliefs and principles. Our aim is to provide a consistent, effective service through intelligent design. Our strengths lie in branding and identity, design for print, packaging, photography and new digital media linked with the ability to fully immerse ourselves in our clients’ expertise and ethos. Our approach is one of collaboration. We like to hear your views and reactions to our work. You deal directly with the studio rather than through account handlers and are part of the creative process from the outset, forming a close working relationship to deliver clear, strategic solutions. Our success is down to our creative flair and genuine love for what we do, backed up by our tightly knit team and up-to-date technology. Our design awareness is constantly enriched by new trends and talents as well as having a huge amount of respect for design classics. We view each project as an opportunity to create a memorable body of work, from a complete identity programme to an individual project and relish the opportunity to generate long lasting and fruitful relationships. We firmly believe that the design process should be an uncomplicated and enjoyable experience, placing great importance on establishing a clear brief, with achievable goals and objectives. We appreciate and understand that everyday issues such as deadlines and budgets are important, with no room for mistakes and are proud of our history of completing projects to the highest standard, on time and within budget. We don’t fall at the final hurdle… with the industry experience gained over the years our team has an in-depth, first hand knowledge and interest of the print and production process. Our digital skills and precise technical abilities allow us to produce artwork to the highest of standards avoiding potentially costly delays in production processes. Wherever possible we see a project through to completion and delivery with the confidence that the outcome will be to both ours and our clients exacting standards. This attitude and attention to detail has allowed us to work with some of the most recognised brands in the world, with our technical skills ensuring brand integrity is maintained throughout any media.